^ 2.0 2.1 2.2 2.3 2.4 2.5 Davies, S.J.J.F. 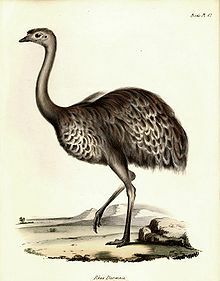 Rheas. (编) Hutchins, Michael. Grzimek's Animal Life Encyclopedia. 8 Birds I Tinamous and Ratites to Hoatzins 2. Farmington Hills, MI: Gale Group: 69–74. 2003. ISBN 0 7876 5784 0. ^ Robert Krulwich. Darwin's Very Bad Day: 'Oops, We Just Ate It!'. 2009-02-24 [2009-03-30]. ^ 5.0 5.1 5.2 Clements, James. The Clements Checklist of the Birds of the World 6. Ithaca, NY: Cornell University Press. 2007. ISBN 978 0 8014 4501 9. ^ Douglas F. Stotz, John W. Fitzpatrick, Theodore A. Parker III and Debra K. Moskovits. Neotropical Birds: Ecology and Conservation. The University of Chicago Press. 1996. ISBN 0-226-77630-1. ^ Darwin, Charles. Notes on Rhea americana and Rhea darwinii. Proceedings of the Zoological Society of London. 1837, 5 (51): 271–275.